Do you know any funny Pugs? Then you may recognize the following Pug facts that govern the Pug world. I'm a lifelong Pug owner and lover, and I converted my husband a few years ago. He grew up with cats but the second we got our first Pug together, Tater Tot, he was not only a dog lover but a Pug lover. Now we are blessed with what we call the little Pug tornado known as Brisket (food name in honor of Tater Tot). She definitely has her own little quarks, but her behavior is VERY PUG-LIKE and inspired me to write this entertaining post. 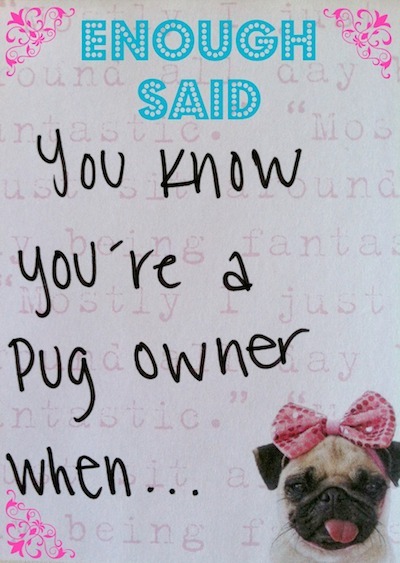 Thus I present to you - You know you're a Pug owner when... - the truth about funny Pugs and their owners. you write a blog post about being a Pug owner and include a photo of a Pug post-it that reads, "You know you're a Pug owner when..."
the top of all of your couch cushions have caved in. you can hear your Pug snoring in the other room...downstairs. you have a Pug shirt that reads, "Pugs Not Drugs." the sound of your Pug's snore actually puts you to sleep...and then wakes you up. there's Pug hair all over your car...AFTER you've vacuumed it. Twice. everyone that meets your Pug brings up Frank from Men In Black. a stranger walks into your house and immediately knows you own a Pug...the sign on the wall that reads, "A spoiled Pug lives here" may have given it away. you're known in your neighborhood, not by your name but, as your Pug's mom. someone stops their car in the middle of the street and gets out to pet your Pug. you follow a bunch of funny Pugs on Twitter. you get so used to your Pug following you everywhere...so if you're Pug DOESN'T follow into the bathroom, you feel like something's missing. 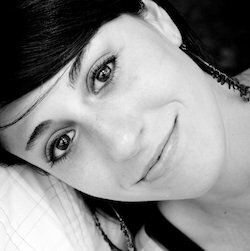 you realize that really loud snore sound in bed is NOT coming from your husband. 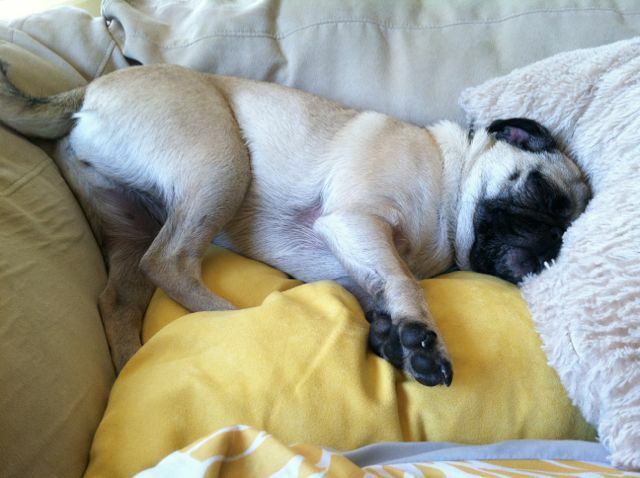 your Pug's behavior starts to rub off on you and waking up in the morning to eat breakfast immediately leads to a nap. your Facebook news feed is inundated with pictures of Pugs from all the Pug-related pages you "liked." your Pug snores with his or her eyes open and that doesn't seem weird anymore. you're convinced that when your Pug meets other Pugs, your Pug knows that he or she is mingling with the same breed. you've accepted that sitting with your Pug on the couch really means that he or she is on top of you. you have to start spelling the word T-R-E-A-T.
you insist that your Pug's not fat...it's just the genetics of the breed. you've said many times, "Don't let fill-in-the-blank-with-your-Pug's-name fool you, she has already eaten her dinner." you're used to little children laughing at your Pug's curly tail. you were able to train your Pug to give a high five in a few minutes...after all, there was a treat involved. you IMMEDIATELY become friends with the other Pug owners in your new neighborhood. you have tons of photos on your phone of your Pug sleeping...that smooshed face never gets old. you attend a Pug meet up...regularly (because you can never have too much of Pug). the love for your Pug runs so deep that you've considered getting a Pug tattoo...a few times. you read a blog post titled, "You Know You're A Pug Owner When..." and then add to it by leaving a comment below! You know you're a Pug owner when...your Pug teaches you more life lessons than you could have ever imagined.